Zucchini Linguine. [never gets old] | Eat More Plants. This is a dish that I never get sick of. Its simplicity makes it something I look forward to making every time. It’d be better if the zucchini was from my own garden but it’ll be soon enough! Bonus: this dish is equally amazing raw or cooked. It’s a nice variation of an alfredo cream sauce, if you like that kind of thang. I was never really into that but I did have a penchant for penne a la vodka. Same concept; pasta & creamy sauce. This will be enough sauce for 4 people, probably more. It does last well in the fridge if you’re making it for less so it’s not necessary to cut it down. Start by adding cashews and 1/2 a cup of the water to your blender. If the mixture is too thick, add the rest of the water. It works well on veggie noodles or pasta when it’s the consistency of a cream sauce. Too thick or too thin and it’s hard to get it to coat your noodles well. Now you’re done with the sauce so it’s time to prepare your noodles! 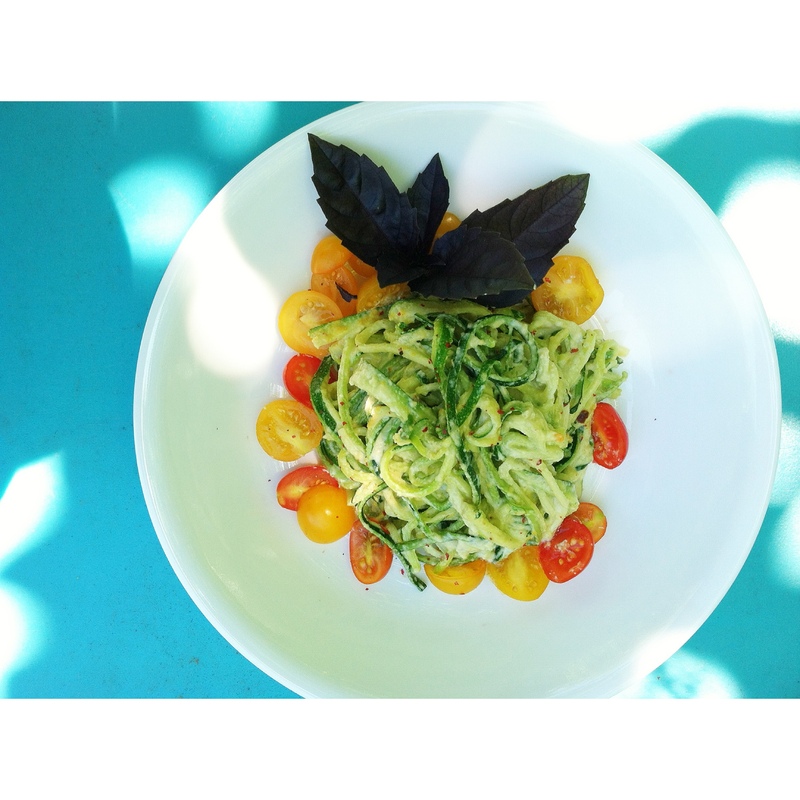 To make zucchini noodles, either use a veggie peeler or a julienne peeler on a green or yellow squash. The longer it is, the better. Also, it works well if you start peeling on one side of your squash and then once you get to the seeds, rotate it. You’ll be left with the inside, seedy flesh intact. To eat this dish raw, combine noodles, cashew sauce and any other veggies. Serve with a squeeze of lemon and fresh basil. If you want to cook the noodles, heat 1 tsp of grapeseed, olive or coconut oil in a pan over medium low heat. Add noodles, a pinch of salt and any other veggies to your pan. I usually add some tomatoes and red pepper flakes at this point. Sauté for a few minutes just until noodles soften and add your cream sauce. Mix well and cook for another few minutes until the sauce is warmed. Remove from heat and serve with a squeeze of lemon & basil. I can’t wait to try this! I like the ingredients in the “cream sauce”. This and carrot pasta are one of my favs! Good work.